It’s hard to believe that Cuddles (now Meta) has been with us almost two months. She has fit right in and adjusted quickly to her new forever home.She begins obedience school this week and will be sure to be a star student because she is so smart and has already learned so much. Not only is she a very intelligent dog, she is also very playful and has changed her favorite past time from picking up rocks to playing fetch with her beloved tennis balls. 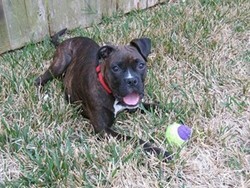 We are truly grateful to the Austin Boxer Rescue for bringing Meta into our lives.